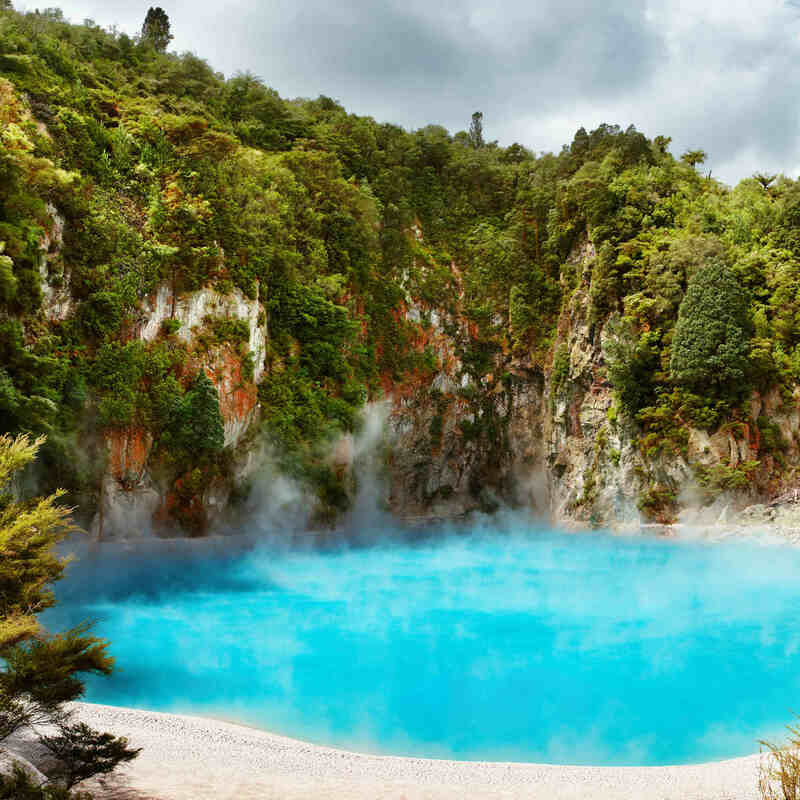 Best known as a geothermal wonderland and rich in cultural heritage, Rotorua is a place you will want to jump into your car rental and explore. Rotorua is situated 230 km's from Auckland, 105 km's from Hamilton, 80 km's from Taupo and just 60 km's from Tauranga. So, regardless of your original destination, you'll want to get the most of your car hire and drive to, or around, magical Rotorua! You'll be surrounded by 18 Lakes, so don't forget to pack the fishing rod, camping gear and swimmers into your hire car before embarking on your journey. Take a drive to Lake Tikitapu, also known as Blue Lake by the locals. Located on Tarawera Road, take a swim in the blue waters or walk along the 5.5 kilometre walking track through native bush land. Also a great spot for fishing with the vast amount of wild rainbow trout! VroomVroomVroom tip: Fly and trolling are your best options for the keen fisherman. Staying with the same theme, Lake Okareka is another great recreational lake for your enjoyment. This is one of the few lakes in Rotorua with a campsite right next to the lake. At only $10 per adult and $5 per child a night, you won't need to book as first-in, first-served at this great lakeside spot. Lake Okareka has all the fun swimming, walking and fishing activities you'd expect to revel in. Accessible by boat only is Te Rata Bay in Lake Tarawera. As is a common theme in New Zealand, it has an alternative name which is Hot Water Beach. It also has a water taxi operating. Relax in geothermally heated beaches or cook food in the thermal sands. That's right, you read that correctly. COOK! Not something you can do anywhere else in the world! 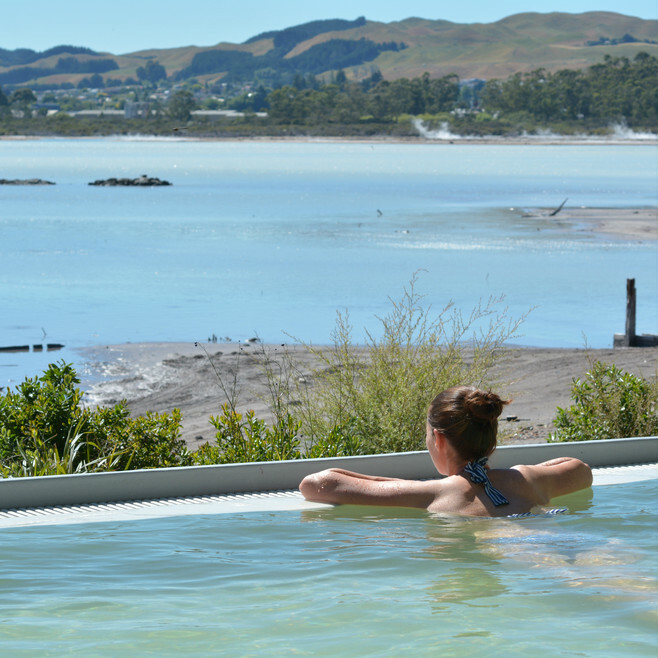 Te Rata Bay or Hot Water Beach has a campsite with similar prices to Lake Okareka, so you can stay at this amazing geothermal paradise. If you'd like to try refreshing thermal waters without taking a water taxi, drive your car rental 33 km's from Rotorua to Kerosene Creek on Waikaremoana Road in the Kaingaroa Forest. Kerosene Creek is a natural heated spring set in native bush land with a 2 metre waterfall backdrop. Once you've made the most of fishing, swimming and walking, come back to the city of Rotorua to relax in the lively community. Kuirau Park, just off Ranolf St., is the only public geothermal park in New Zealand. You'll appreciate the gardens, playground, bbq area and picnic tables you'd expect at any park. However, you'll be really impressed with the free thermal foot baths available to soak your feet and relax in. If you're lucky enough to be there on a Saturday, Rotary organises a community market between 7am and 1pm every week. Last but never least is the Thursday night markets, held in Tutanekai Street from 5pm – 9pm every week. Enjoy the community atmosphere, arts, crafts, ethnic cuisine and local musicians. How can you not enjoy all Rotorua has to offer?! Book your hire car now with VroomVroomVroom and take advantage of this majestic New Zealand paradise!